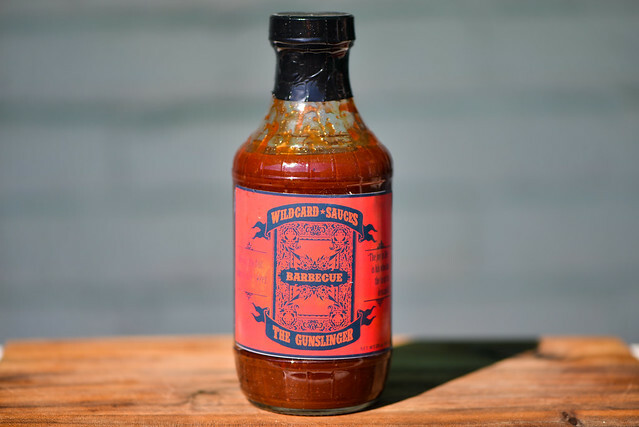 Wildcard Sauces The Gunslinger deliver an mouth scorching heat against a well balanced standard tomato barbecue sauce base. Wildcard Sauces started as an escape for brothers Ryan and Kyle Fraser. Fed up with giving their souls to corporate America, they set off on a venture to free themselves, which translated into making barbecue sauce. Looking to please the masses, the brothers did a little market research and found everyone has their own saucy preference. 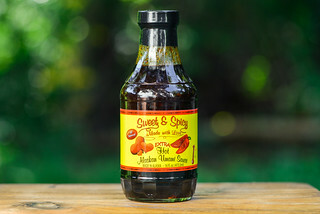 Instead of making one master sauce, they came up with three recipes that focus on delivering great flavor using locally sourced ingredients from their home area of Raleigh, NC. 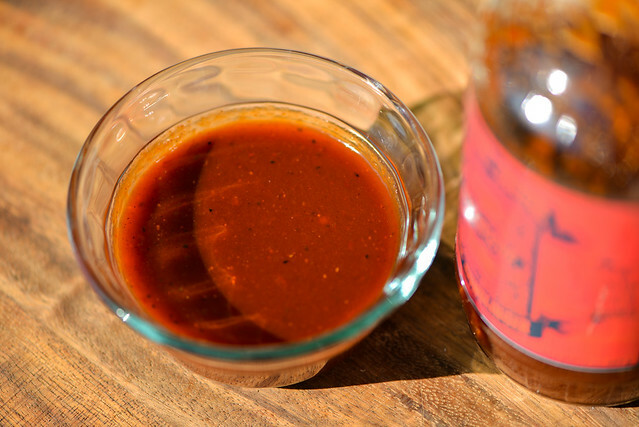 This sauce hits the barbecue standards of vinegar and tomato hard and in an even balance on first smell. Right behind those are secondary layers that include Worcestershire, onion, garlic, and a very faint smokiness. There's definitely a hint of heat in here, which contrasts with the mild sweetness also present. Although this maroon sauce is pretty opaque, it's so loaded with spices that you can easily make out the specs of black and red pepper, along white spots that are likely garlic and onion powder. Its thickness is smack dab in the middle on the scale. It flows quickly and in a steady stream from a suspended spoon, ending with a few final drips and leaving an even, thin layer left coating the silverware. A lightly sweet tomato flavor starts off this sauce. As it settles on the tongue, Worcestershire comes out along with notes of onion and garlic. A vinegar tang then begins to make its way in there and for a short while creates a nicely balanced and well layered sauce. That is until the heat starts to rear its head. An onslaught of peppers overtakes all else, and with habaneros and cayenne making up the base of the spice, it's damn hot—so much so that elicited the hiccup response for me that is only brought on by the spiciest of foods. By the end, all traces of the other barbecue sauce flavors were gone and I was left with a burning mouth. This sauce coated the chicken well and evenly, baking in nicely over indirect heat. Over direct heat, there was some modest caramelization with no burning. The tomato flavor was amped up out of the gate, with only a light sweetness behind it. It turned tangy pretty quickly, and retained its heavy hit spice at the end, although it was not as mouth scorching as it was out of the jar. 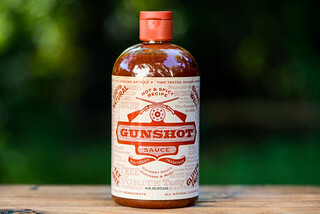 Those who read these review regularly know I'm a sucker for spicy sauces, which is why I requested The Gunslinger when Kyle asked if I'd give one of his sauces a review. This sauce certainly delivered the heat in a big way, being incredibly hot out of the jar, and retaining a nice level of heat after being cooked. The base that the heat sat on top of was a pleasantly layered barbecue sauce that hit the notes it needed to including tomato, vinegar, and sugar. That being said, it was more the level of heat than other flavors that made it stand out, which dropped this one just a notch below some of my favorite extremely spicy sauces that did a little more interesting things with their bases. 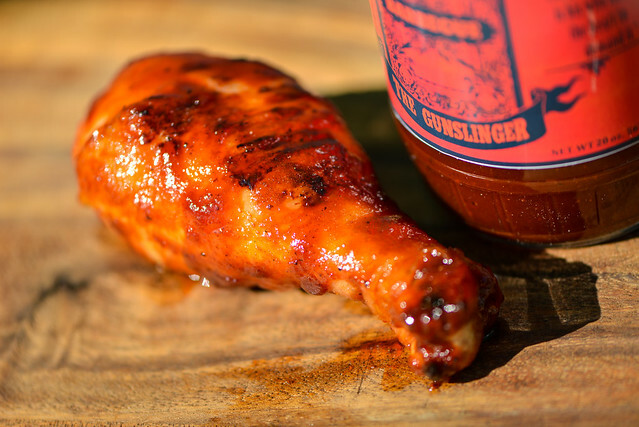 If you love spicy sauces, the Gunslinger is going to deliver for you both on and off the grill, making it a great choice for heat seekers. Kyle was kind enough to send along a second bottle of sauce to offer as a giveaway to all you Meatwavers. 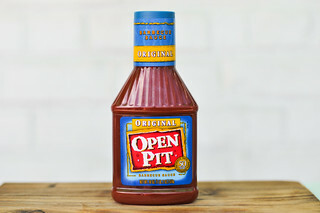 To enter to win this bottle of sauce, comment on this post with your preference in barbecue flavor: spicy or sweet. Deadline for entries is 11:59pm on Tuesday November 26, 2013. Read the official rules for more details. One entry only per individual. Good luck! I'd go with spicy. This post made me slobber! Also, I live in Texas, so I know and love my barbeque! Sweet with a little bit of pop! I love sweet but my husband prefers spicy. I prefer it sweet but with just a hint of spicy. Looking forward to trying the sauces, spicy of course. I like it sweet and spicy. But probably not in the same level as your "extreme" spiciness, lol.